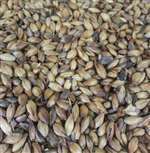 Authentic English extra dark crystal malt that lends burnt sugar and dark fruit flavors. Contributes a deep amber color. 135ºL - 160ºL.